McDonald's robust dividend history may no longer be indicative of future increases. McDonalds (NYSE:MCD) wasn't immune to the market sell-off earlier this month. Sure, it wasn't hammered as hard as high-flying growth stocks, but a 4% pullback on a stalwart like McDonalds is worth looking into. One of the great things about dividend paying cash cows like McDonald's after share prices decline is the their dividend yields go up, making them more enticing for income-seeking investors. Trading around $95, and with a dividend yield of 3.4%, is it a good time for income investors to buy McDonalds stock? McDonald's is a familiar name in the income-investing world. And it should be. Since the company first paid a dividend in 1976, the company has raised its dividend every single year. Even recently, McDonald's dividend hikes have been meaningful. In 2012, 2013, and 2014, McDonald's increased its dividend by 10%, 5%, and 5% again, respectively. But as can be seen by reviewing the McDonald's dividend increases in the past three years, the company has been less aggressive in these increases lately. There's a good reason for this. Its free cash flow, or operating cash flow less capital expenditures, has leveled off in recent years. Indeed, McDonald's free cash flow in the trailing 12 months of $4.3 billion is still below it's $4.4 billion in the free cash flow in 2011, when its free cash flow peaked. With free cash flow growth coming to a halt in recent years, it's no longer is easy for management to justify 10% annual increases in its dividend. But by how much is McDonald's dividend growth limited, going forward? Income investors can get some insight into whether or not McDonald's dividend growth is constrained or not by looking at the company's dividend payout as a portion of free cash flow. Of McDonald's $4.3 billion in free cash flow in trailing 12 months, the company paid out $3.2 billion in dividends, or about 75% of its free cash flow. So, there is some wiggle room for McDonald's dividend -- and some room for dividend increases even if McDonald's free cash flow doesn't grow. But investors should take note that historically McDonald's has usually paid out a much smaller portion of free cash flow in dividends than its paying out today. For instance, in the years leading up to the 2007 and 2008 recession, McDonald's was paying out less than half of its free cash flow in dividends. It stands to reason, therefore, that in the future it won't be as easy for McDonald's to increase its dividend as it has been in the past. Longer term, the fact that McDonald's hasn't given investors any evidence it is on a path to turn its free cash flow around back toward growth is a real concern. If the company doesn't find a way to begin growing its business again, dividend increases could come to a halt. After all, McDonalds can't increase its dividends beyond annual free cash flow without eating into its cash position. A similar theme in McDonald's dividend payouts can be seen by analyzing its payout ratio, or its dividends as a percentage of earnings. 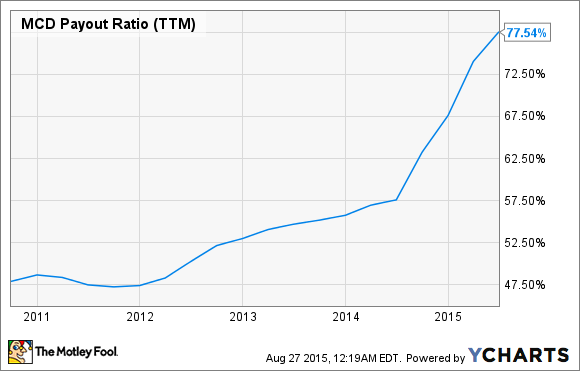 During the last five years, McDonald's payout ratio has been climbing. McDonald's dividend increases, therefore, are certainly facing some headwinds. Going forward, investors shouldn't expect meaningful dividend hikes. It may be wise for income investors interested in McDonald's stock to wait for sure signs of a return to free cash flow growth. Without it, dividend increases aren't as certain as they have been in the past.